Backgammon is one of the oldest board games ever invented. This unique game originated more than 5,000 years ago in Mesopotamia and has not lost its popularity ever since. Of course, over the years, backgammon has changed and developed significantly. Today, we can play it as a board game, or we can play backgammon live on numerous websites. This game would not have stuck around for so long if it wasn’t incredibly fun to play. However, is that all that it has to offer? We believe not, and there are a lot of players and experts who agree. On top of being great for making friends and passing the time, backgammon has numerous cognitive and mental benefits as well. Let’s take a closer look at them and explain why you should learn to play this ancient game, if you haven’t already. There is one thing that a lot of board games have in common — they provide a great workout for your brain. That is especially true for backgammon. Learning the basics of it is not difficult, but it is incredibly complicated to master it. Players usually need a lifetime to acquire complex skills, which means that learning never stops with this game. As you grow old, it becomes more and more important to challenge your brain and give it something else to do other than watching TV. Backgammon is the perfect solution because it helps you practice your memory, reasoning, and logic. We live in an age where stress is considered a normal part of life. Unfortunately, staring at our computer and smartphone screens, comparing our lives to those of others certainly does not help. However, backgammon can help you relax by taking your mind off daily worries, as it requires your full attention. Moreover, backgammon can be played even if you’re on a vacation or wellness retreat, such as one of Zing Events. You can play it with your friends and family while relaxing by the pool, on the beach, or while enjoying a spectacular view. You can easily carry it in your travel bag or play it on a tablet or another device. 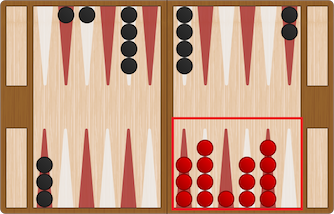 Backgammon is a social game intended to be played with other people. Of course, thanks to modern technology, you can play it against the computer as well. That can be a good solution sometimes, but backgammon is the perfect excuse to meet new, interesting, and like-minded people. Most countries and cities in the world have local backgammon clubs where you can go and play this game with other enthusiasts. It is well-known that board games are one of the best ways to make new friends. If there isn’t a local backgammon club near you, you can always play online against strangers and expand your social circle that way. Learning to win and lose with grace is an important life lesson that we should teach both kids and adults. Backgammon, along with other board games, allows us to deal with conflict in a controlled environment and experiment with different methods of conflict resolution. That is especially important for children and those extremely competitive individuals who believe that losing equals the end of the world. Learning how to lose has a lot of benefits for children. Among other things, it teaches them not to lose confidence and not to doubt themselves when things do not work out exactly the way they planned. Playing backgammon not only improves your cognitive abilities, but it also prevents certain physical and mental diseases. One of those is Alzheimer’s disease — an illness seen more often in older adults who do not practice mental skills. By playing backgammon, you can slow down the development of dementia or prevent it completely. Moreover, if you learned how to lose in the section above, backgammon will lower your blood pressure. Playing backgammon with a friend is relaxing and stimulates endorphins and other “happy chemicals” in the brain that are known to lower blood pressure and keep your heart strong.